Changing the flooring in my hall way has had an instant and dramatic effect when you walk through the front door. The terracotta ceramic floor tiles are a distant memory, and the new wood effect lino runs from the front door through the hall, to the utility room and kitchen dinner. The addition of a new stair carpet in a colour that compliments the lino has worked exceptional well. Making such a dramatic change in any room can impact on the overall look and feel of the room. 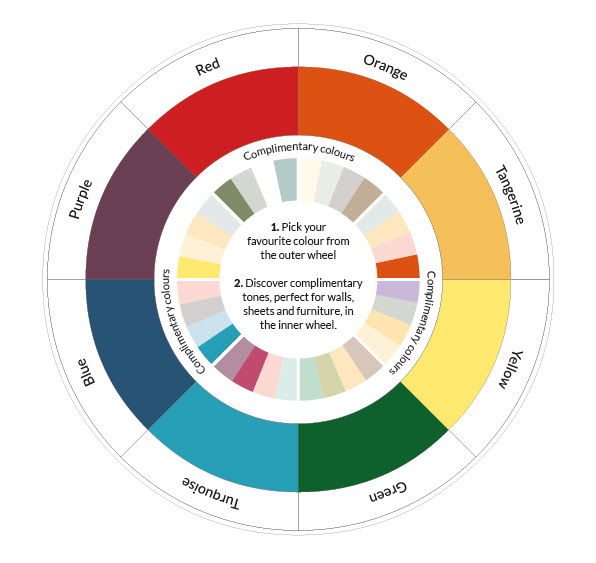 If you are unsure which colours work best together, or you are looking for inspiration before you plan your redecoration using a colour wheel can be a great help. George Home, have created a Wheel of Colour, they call the Wheel of George to guide you in your choice. For example the use of subtle hues can be matched with a shot of vibrant bright colour maybe in your choice of accessories. The change in flooring and carpet has had a big impact, resulting in a rethink of what items and ornaments still work in the space. I decided I would create a theme, using nature as inspiration. I started by removing some items eg. ornaments, picture frames allowing me to see gaps in my accessories. Two key items that were essential were a large rug for the front door and a runner for the hall way. Choosing a large natural jute rug and matching jute runner, gives my new floor protection from muddy shoes and keeps to my nature theme. Pretty butterfly fairy lights draped around the hall mirror, will add warmth at dusk and a whimsical feel. The addition of a candle and room diffuser scented with berries helps continues the nature theme, and add ambiance. Following my choice of butterflies I was also taken with a mirrored bee trinket box, the perfect spot for a spare key or emergency coins. Finally an open style wooden picture frame, with twine and mini pegs to display your chosen photographs. I am actually not putting a second photo in the frame, but will hang a note in its place, where I can write important appointment reminders for the week. Of course adding a display of flowers from the garden really does bring nature into the entrance hall, I think these roses displayed in a recycled glass bottle adds the finishing touch. I love the Jute rug for the front door, it has received so many compliments from family and friends. My other favourite is the picture frame, I love it because its a little different and great value. Details of the items mention in this article can be purchased online from Asda George. If you want to ask me more about any of the items, just leave me a comment below, or contact me via social media. Disclosure: Collaboration blog post with Asda George.